I recently saw the idea for Southwestern egg rolls on Mel’s Kitchen Cafe and was instantly interested. For one, I have never made egg rolls; they are still on my list to make. Secondly, I love Mexican food. I was surprised to see that they were inside tortillas instead, but figured that is probably a better idea anyway. I decided to make my own combination of ingredients for the filling, because I wasn’t a huge fan of the black beans in the recipe I saw. I think that the refried beans are perfect for the filling because they keep it from becoming too dry. More green chiles can be used in the recipe if you want your rolls extra spicy. You could also add rice for some added texture. These little egg rolls are great as an appetizer or as a full meal. Just know that they are really filling! My roommate and I ate three each for dinner and were stuffed. Preheat the oven to 400F. Heat the olive oil in a large skillet over medium heat. Add the chicken, onion, garlic, red and green pepper to the skillet and season with cumin and chili powder. Sauté until chicken is cooked through (about 5-8 minutes). Add the green chiles, corn, refried beans, cilantro, cheese, salt and pepper to the mixture and stir until well combined and cheese is melted (about 3-5 minutes). Microwave the tortillas between damp paper towels until soft (about 30 seconds). 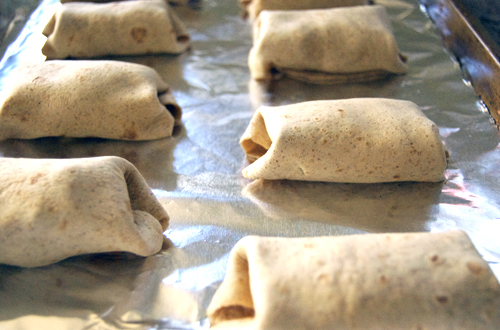 Scoop about ¼ cup of filling into each tortilla and wrap like an egg roll, tucking in each end to finish rolling. Place each seam down on a greased baking sheet. Bake the egg rolls at 400F until tortillas begin to turn golden (about 15 minutes). Serve with salsa and guacamole. Wow this is brekky delight! So tempting! Totally my kind of egg roll. We have a Tex-Mex restaurant here in KC that serves mini Mexican egg rolls, they are awesome! This sounds like a great recipe and easily adaptable to what you might have leftover. Those look fantastic! I love the addition of the beans with it. Thanks for sharing! I like it just like you’ve made it! Looks delicious!! I’m with Kate except I’ll just narrow it done to anything with “mex” as part of the title! These look awesome! These look great! I love that they are baked too. Tex – Mex version is such a good idea! I am not a huge fan of traditional egg rolls, but these look amazing! That looks super yummy! I know the boyfriend will be down for these! Thanks for sharing! Haha I like that “chino-latino”, rolls off the tongue well. I am LOVING this idea!! Why didn’t I think of this before? I would definitely gobble up a few of these no problem! 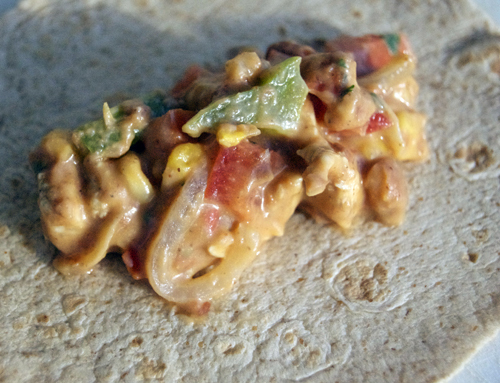 what a delicious combination of ingredients inside your tex-mex egg rolls. I’m glad you used refried beans, I have never really been a fan of black beans, growing up we always ate pinto beans. Those are so yummy..I think I will make them for dinner tonight! Congrats on top 9!!!! 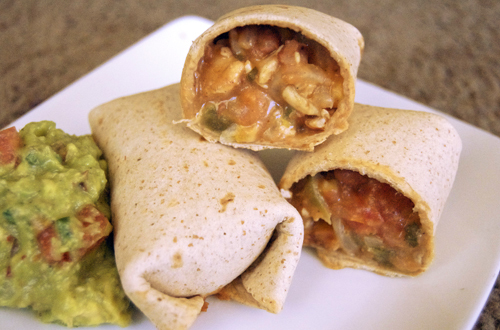 Umm… aren’t these called burritos? haha Close, but not really. 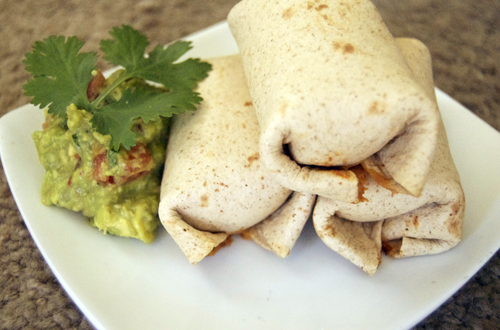 Burritos are soft tortillas, these are baked so the tortillas are crunchy, like an egg roll. These are also much smaller than burritos. Not burritos, but Chimichangas. Mini, baked (not fried) chimichangas, but chimichangas none the less. They are at every Mexican restaurant here in South Texas. Hmm.. these look strangely familiar to the ones I posted last week. Whether or not you saw them on my blog or somewhere else, you really should cite your source. Congratulations on making Food Buzz’s Top 9 – your ingredients look delicious and I love that they were baked! Whatever you call them, I made these last night for my family and they were fantastic! I actually used a can of black beans (drained, but not rinsed) because I’m not really a fan of refried beans. I was surprised by how wonderfully crunchy they were – like an egg roll but so much better for you. Two was certainly a whole meal for me! I served them with a simple cilantro cream dip (1 cup light sour cream, 3 minced garlic cloves, 1/4 cup salsa, 1/4 cup fresh cilantro, 2 scallions blended in food processor). I will be adding these to my permanent home dining menu. Thank you for sharing! Sounds amazing! Glad you liked them, your dip sounds like one I need to try!